I am very thankful to god that he have saved me from many accidents.Every day we hear news of accidents and mishaps.Disasters can struck anywhere anytime to anyone.Lemme remember some important accidents that happened to me. I was a slow learner in cycle, scooter and car.I started to learn cycling at the age of ten.I was not successful in cycling well.At the age of 12, i managed to ride a ladies cycle.I was going to my paternal ancestral home from my home one day.The purpose of my visit was to get some milk.There was a cow in my grandfather's home.I was to collect milk for my nuclear family from my grandfather's home.Now on the way to there, there is a home called 'Palavilayil'.It was the house of Babymaman (Uncle Baby) as i called him.He was one of my father's close friends. The road was steep near 'Palavilayil'.Water running during the rainy season through the road made many crest and trough on the roads.Someone kept stones on those potholes.So the poor kid (thats me) fell there with bruised hands.Now Babymaman helped me and i got semiyapayisam (a sweet pudding) and so i forgot the pain.Babymaman is no more now. When i was 13 my father bought me Hercules MTB cycle from ernakulam.I used to cycle ten kilometers to my school, Cherupushpa Bethany School in Chunakkara ocassionally.I go by bus daily but cycling was fun.My cycle chain got jammed and i was standing and cycling on an uphill and lost balance.That time i had to get my leg stitched up.The principal of the school to whom we paid Rs 10 as insurance paid up the expense (Rs 100).Next day my father gave me the Rs 100 and i returned back to the Principal. After my tution class which ends at 6pm, i cycle back five kms back to home.One day BSNL mazdoors were laying OFC (Optical fibre cable) and my cycle rode on that cable laid on side of the road to be buried inside the earth.These mazdoors were moving the cable and i lost control when i rode over the cable, then too little injuries. I was hit by an M80 scooter running at a slow speed while crossing the road carelessly in my 16th year.Again no problem for me but the rider lost control and fell down. Maruti 800 Car Hit on Rear by Tata Safari. 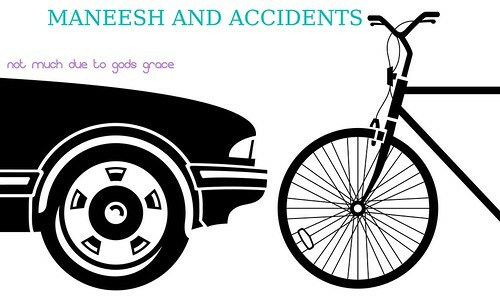 On the day when my uncle died,i drove my car back to home from my uncle's home.I slowed at a bump ahead where a speeding tata safari hit me and ran and took a sideway shortcut.We followed him but to no avail.We were confronted by pedestrians hit by the speeding Safari and so we lost that reckless driver. This time my age is 24 (March 2008) .The time is about 1:50 pm.The Federal Bank Charummoodu branch where i had an account was going to close at 2pm.There was about Rs 25000 in my bag.One person has transferred Rs 10000 to my account.My idea was to get to the bank and deposit the Rs 25000 at the bank.My father was admitted at the hospital in Kochi and recovering from the claws of death.I came to the hometown to arrange some money for the expense.I managed to get Rs 25000 and got Rs 10000 transferred to the bank account as mentioned earlier. The Rs 25000 was borrowed by Sabari Chits & Bankers (a private finance company) in Nooranad.I had to sign a cheque of Rs 25000 and a blank promissory note.By the way eventhough i repaid the money within five days they bought interest Rs 750. My father has given Rs 10000 to a businessman who runs a retail store.When asked for it back, this person got the money transferred from the account of his girlfriend to my account at Federal Bank Charumoodu.By the way i have now closed the Federal Bank charummoodu.But i still believe Federal Bank is a good bank to keep your money.I have bought shares of Federal Bank and i think it is a good bet. Now i was speeding very well driving in 80 km per hour.A KSRTC bus was coming in the opposite direction and the old man who was driving the Maruti Zen hatchback running in front of me got scarred and jammed the brakes as a result of which i got hit on it's rear.I got injured but nothing serious.I fell on the ground.I was in a bad state of mind as i felt like a defeated warrior.Some days back, my father was hospitalised in critical condition.I was in urgent need of money.I find life difficult from many sides.All of a sudden, an accident when i will have to spend money to repair the car for the damage i have done. It is true that when the mind is dull and spirits are down, we always do wrong things.I was standing there very depressed. The driver of the car and his wife came out and scolded me a lot.I apologised and requested them that i shall give them money once they allow me to go as i had to reach kochi urgently.I regret for my behaviour then.If it was today, i would have never felt afraid and feel deserted (i guess so).I didn't call my friends or extended family to deal with the situation.Actually if i had called someone there was no problem for me and there was no need to pay any money and all. The old man took my weakness as an advantage.He demanded Rs 3000 which i declined.All of a sudden, a native of our place landed and he suggested we all go to a nearest maruti workshop.The workshop man told that it costs Rs 1500.The car owner told that he need to get his car repaired at the dealer workshop only and he shall return if any money left after the 1500.This native paid that money which my father gave me later when he got back from the hospital.Weeks later the Zen driver called and i rode to his place and i drove on the same bike to his place and he gave me Rs 700 back. This was an experience to me.Again this made me weak that i let go a sixteen year old boy who got a scratch in my new car.Thats another story that i can share another day.Now i have made a resolve not to panic if any accident occurs.There is insurance for the vehicles and the people.There are rules and laws in the country.As long as you are driving well and not recklessly, you do not have to fear anyone. Amazing Escape from a motorcycle. A motor cycle behind my motorcycle was going to hit me.Sixth sense told to speed up and i was saved by gods (guess little help from my father now in heaven).It was during this january 2010. There are more incidents which i remember well..But i am not sharing all of these.